Half-Chechen, one-time aide to Khodorkovsky, sometime novelist and current-day political technician, Vladislav Surkov’s life story lacks anything but colour. Yet the adjectives most usually attributed to his political figure are “grey” and “shadowy”. Richard Sakwa reviews a collection of speeches and essays in attempt to get closer to the secretive man some claim to be the third most influential in Russian politics. Vladislav Surkov is one of the most intriguing and powerful men in contemporary Russian politics. He joined the Presidential Administration (executive office) in 1999, and currently exercises power as the senior deputy head of the administration responsible for domestic political affairs. He is considered the main architect of what is colloquially known as “managed democracy”, the administrative management of party and electoral politics. He is also an intriguing personality, having apparently published a novel under one pseudonym, and then reviewed it (not entirely favourably) under another. Like so many of Russia’s contemporary elite, he also fancies himself as something of an intellectual, hence the various articles collected in this volume. 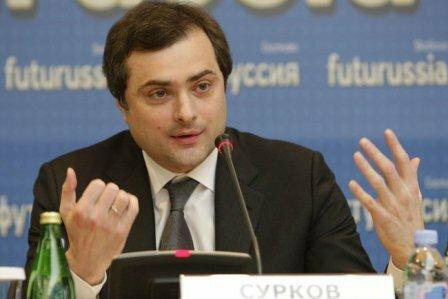 According to his official biography, Surkov was born on 21 September 1964 in Solntsevo in Lipetsk region. However, in an interview in June 2005 he revealed that his father, Andarbek Dudayev, was Chechen (not a close relation of Chechnya’s president of that name) and his mother Russian. He lived in the Chechen settlement of Duba-Yurt and then Grozny until roughly five years of age before relocating, along with his mother (Zinaida Surkova), to Lipetsk region following the break-up of his parents” marriage, at which point he took his mothers surname and changed his first name from Aslanbek to Vladislav. After leaving school his studies at the Moscow Institute of Steel and Alloys were interrupted by military service, which had become compulsory at that time. In 1983-85 he served in the Soviet Army, officially in an artillery regiment in Hungary, although in a television interview on 12 November 2006 the former defence minister Sergei Ivanov claimed that he had served in the counter-intelligence service (GRU). In the late 1990s he studied at the International University in Moscow, where he gained a masters degree in economics. He was one of the early members of Mikhail Khodorkovsky’s team at Bank Menatep, which in 1994 bought a controlling share in the Yukos oil company. Between 1992 and 1997 Surkov was on the board of directors of Menatep. Surkov was head of advertising and devised the early campaigns that made Khodorkovsky famous. At the same time he was also an advisor on public relations to the Russian government. His ability to straddle the world of business and public service was to be his hallmark in years to come. In 1998-99 Surkov moved to work for Al’fa Bank, after what appears to have been an acrimonious falling out with Khodorkovsky over shares in Yukos’s rising profits. In early 1999 he was recruited by the new chief staff in the Kremlin,Alexander Voloshin, to work in the Presidential Administration. From that point he never looked back. In August 1999 he was appointed deputy chief of staff, and in that position he became Vladimir Putin’s chief ideologist once the latter came to power following Boris Yeltsin’s resignation on 31 December 1999. Throughout the 2000s to this day Surkov’s main responsibility has been to manage the public sphere. He has done so with great gusto, helping reshape the political arena with various interventions in shaping the legislation on parties, and then micro-managing the electoral process and monitoring the media. To that degree he is one of the main architects of the stifling of independent public contestation and the political pluralism that had run riot in the 1990s. 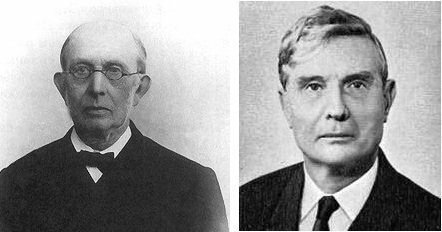 Vladislav Surkov’s predecessors as Russia’s court philosophers: (Left) Konstantin Pobedonostsev, supporter of tsarist autocracy under Alexander III and Nicolas II, and (right) Mikhail Suslov, the elusive high priest of post-Stalin Soviet ideology. 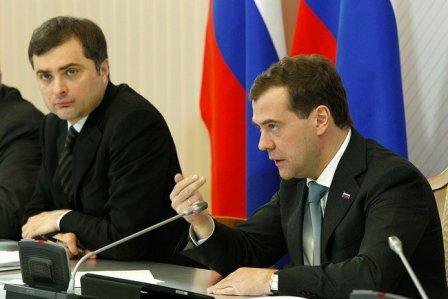 With Dmitry Medvedev’s accession to the presidency, on 8 May 2008 Surkov was promoted to become first deputy chief of staff of the Presidential Administration. This indicated that democracy in Russia would continue to be “managed”. His main vehicle for this was the creation and sponsoring of United Russia (Yedinaja Rossiya), as the regime’s pedestal party. He was also involved in the creation of Just Russia (Spravedlivaya Rossiya) as a centre-left social democratic alternative to the right-centre United Russia, but it is clear that his heart was not in this particular project. Surkov’s philosophy from the first was that there is no real freedom in the world, and that all democracies are managed democracies, so the key to success is to influence people, to give them the illusion that they are free whereas in fact they are managed. The only freedom in his view is “artistic freedom”. In an interview in January 1997, reproduced in this volume, Surkov enunciated a thoroughly statist perspective. Asked about the chances of economic growth, he insisted that “if genuine state management of the economy does not appear, there will be no economic growth” (p. 137). He insisted that, as in war, national priorities should be established, and then it was matter of will to see them implemented. The spirit of Surkov’s thinking was unmistakeable, and it would lead him to be one of the most eloquent defenders of Putin’s consolidation of the state and the leading advocate of the notion of ‘sovereign democracy”. Surkov can be defined as a “democratic statist”, and is thus not part of the ‘siloviki” faction, those associated with the security forces who advocate some sort of “iron hand”. Even though Surkov may have conducted his period of military service with military intelligence, he is not one of the siloviki, but neither is he wholeheartedly one of the civiliki, the technocratic liberal faction which exercises a strong influence in shaping Russia’s economic policy. Instead, as a democratic statist Surkov is one of the main ideologists of the notion of ‘sovereign democracy”, the position stressing the society-forming and leadership role of the state while not adjuring the formal commitment to democracy. As a result, the regime under Putin was able to achieve the “nationalisation of the elites”, and the marginalisation of what Surkov called the “offshore aristocracy”. Surkov has become the court philosopher, undertaking a role like that of Mikhail Suslov in the post-Stalin era in the Soviet Union, or even of that of Konstantin Pobedonostsev under Alexander III and Nicolas II. His writings reveal the inner beliefs of the regime. Surkov’s views were systematised in his speech to United Russia activists on 7 February 2006, called “Sovereignty: The Political Synonym for Competitiveness”, in which he warned of two key dangers for Russia: “national-isolationists” on the hand, who sought to move away from Russia’s civic definition of citizenship; and those in favour of a return to the alleged oligarch dominance of the 1990s, supported by home-grown liberals and foreign sponsors. In late 2006 he developed the notion of sovereign democracy further in an article called “The Nationalisation of the Future: Paragraphs on Sovereign Democracy”, which once again grappled with the issue of the native roots and forms of democracy in Russia. Surkov therefore is both a commentator on contemporary Russian politics as well as someone who plays an active part in shaping the contours of political life. In the key speech “Russian Political Culture: The View From Utopia”, presented to the Russian Academy of Sciences on 8 June 2007, Surkov provided the philosophical foundations for the new approach: “However much the organisation of the state may change, for all the uncertainty, the basic matrix is preserved of a consciousness [in which] synthesis predominates over analysis, intuition over reason, gathering things together and not dividing them”. The outcome for Surkov is clearly expressed in three fundamental characteristics of the Russian mentality: “The striving for political wholeness and centralised power, the idealisation of goals, and the personification of politics”. Once again Russia was governed by a ruling class with a strong patriotic vision of the country’s development, and undoubtedly it drew on the long tradition of national self-affirmation against real and perceived enemies. The quality of the political philosophy is not the issue, but what it reveals about the thinking of the regime. Surkov has become the court philosopher, undertaking a role like that of Mikhail Suslov in the post-Stalin era in the Soviet Union, or even of that of Konstantin Pobedonostsev under Alexander III and Nicolas II. His writings reveal the inner beliefs of the regime. With Dmitry Medvedev’s accession to the presidency, on 8 May 2008 Surkov was promoted to become first deputy chief of staff of the Presidential Administration. The theme of this speech reiterates his message of his years in the Presidential Administration: that there is no universal democracy, but only specific forms that reflect a country’s traditions, political culture and psychology. He supported the centralisation of power during Putin’s presidency, and thus his arguments contributed to the erosion of political pluralism and diversity. His views no doubt are contradictory, espousing the role of centralised leadership while at the same time extolling Russia’s tradition of local government (notably the zemstvosestablished by Alexander II) and insisting the “wholeness” is compatible with the competitiveness that is the hallmark of any democracy. His work is also concerned about developing a dynamic model of modernisation for Russia, but the rather heavy-handed model of political management that he practices runs counter to this ambition. 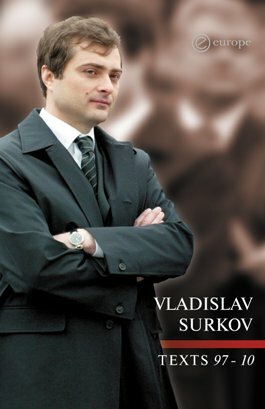 Surkov’s enunciation of the principles of sovereign democracy, and condemnation of those Russian intellectuals “for whom the sun rises in the West”, provides a specific vision of development that has enormous resonance in contemporary Russia, as the country seeks to shape for itself a political identity that is both distinctive while part of the broader patterns of contemporary modernity. Surkov’s published works reveal engagement with these issues, accompanied by a playful self-awareness in which one senses that he is not taking all of this quite seriously. This is a dangerous combination. One can fear rulers when they believe in themselves, but when the authorities begin to treat power as a joking matter the mask slips and legitimacy wanes. Vladislav Surkov, Texts (Moscow, “Europe” Publishing House, 2010), 144 pages.